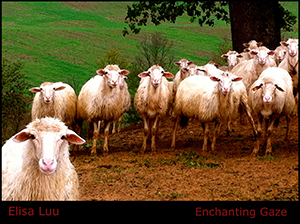 Elisa Luu’s “Enchanting Gaze” Mini-Album Out Now! We’re excited to announce the release of the stunning new mini-album Enchanting Gaze by Italian ambient electronica artist Elisa Luu. The album is available on CD and Digital through La bel netlabel in collaboration with Hidden Shoal via La bel’s Bandcamp. Don’t forget to grab the free download of the first single ‘Shebeen’ here. On Enchanting Gaze, Elisa Luu’s shimmering tones and deftly handled rhythms are manipulated into breathtaking new shapes. On tracks such as ‘Bro’, expansive synths paint wondrous starscapes, while the gritty ‘B.P.M.’ chases beats and growing drones through dark city streets. Enchanting Gaze manages to beautifully balance its cosmic/terrestrial duality throughout its six tracks, making it a wonderful progression in the Elisa Luu discography.